It is already possible to buy the new Apple Watch in Russia online, although a retail date is still unknown. The price for this gadget currently ranges from $2,600 to $30,000. For a gold model with a 42-millimeter display sold online by Apple in America for $15,000, the Russian online retailer Computer Plaza is asking 1.75 million rubles (a little more than $33,458 at today’s exchange rate), writes the Vedomosti business daily newspaper. Watches with a stainless steel body and a braided bracelet watchband that go for $699 in the U.S. are sold for 139,000 rubles ($2,660) through Computer Plaza. Official sales of the Apple Watch in the U.S., France, Germany, Japan and five other countries began on April 24, 2015. Since then approximately 1,500-2,000 watches have been brought to Russia by private individuals and 200–300 of them have been resold, says a representative from Computer Plaza. 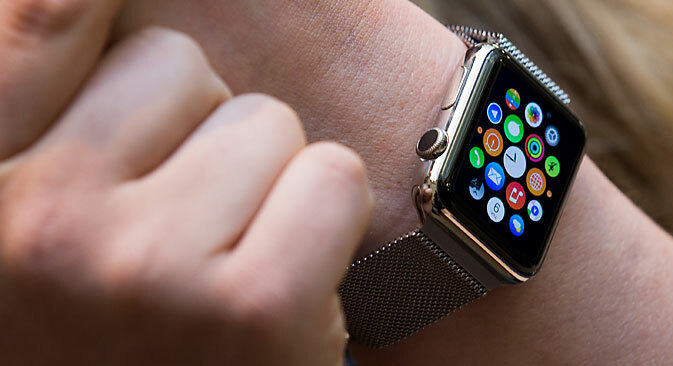 According to the calculations of Eldar Murtazin, Mobile Research Group’s lead analyst, about 1,000 Apple smart watches have been imported and about 300 resold. The price depends on the region: a model that costs 80,000 rubles in Moscow might be sold for 40,000 rubles on Sakhalin Island, Murtazin says. On the whole, smart watches sold by Russian internet retailers cost 2-4 times more than in Europe, admits Computer Plaza’s representative. Therefore interest in the Apple Watch is much greater than demand as consumers are expecting the device to be expensive and cost between 50,000–80,000 rubles ($980-$1,570). Currently, retailers do not know when retail sales will officially begin for the Apple Watch in Russia. Based on previous experience with iPhones, the delay may be from a few weeks to six months according to Vedomosti. The first iPhone never reached Russian retailers at all and Russian sales for the iPhone 3Gs began 6-9 months later than other parts of the world (depending on the model of smartphone). The iPhone 5s and 5с appeared in Russia five weeks after its international release. Bypassing official channels to import the Apple Watch is unlikely to have a significant influence on Apple’s business or sales. “It is a good niche, but the number of potential purchasers is not great,” says Viktor Lukanin, Executive Vice President at Evroset, an electronics retail chain. The experience of other smart watch manufacturers shows that the market for such devices in Russia is still nascent and large sales of these kinds of products are not expected. This is mostly because the watch market is largely conservative, says Lukanin. Mechanical watches with watch faces and arms still enjoy stable demand in Russia while digital displays remain less popular with consumers. However, the Apple Watch might energize the market for smart watches and in turn increase interest in similar devices by other manufacturers, Lukanin adds. “Apple Watch might attract the attention of consumers to this type of gadget in theory,” says Mariya Zaikina, a representative from mobile phone retailer Svyaznoi. While the retail sales date for the Apple Watch is unknown, consumers can get a look at similar devices in stores by other manufacturers, Zaikina says. Material based on an article in Vedomosti.